This is probably a GPS sports watch most people have never heard of but I discovered it on Amazon and was impressed with all the features it packed in for a very affordable price. 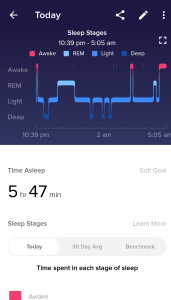 Honestly, I don’t think I’ve been as happy with the results of any fitness tracker as I am with the P1, which I think really needs a better name. 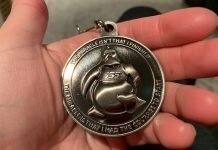 It’s deserving of one. It tested out as a very good inexpensive fitness tracker and GPS running watch. 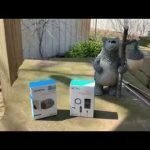 Update: Although the P1 tested out very well for me, I’m beginning to see several reviews indicating problems with charging. So far, I”m not having any of those issues. It may just be a problem with the charging cable but I’m not sure so I’m not super comfortable recommending the watch right now. Most people are happy with the performance of the watch but charging issues may be a problem. 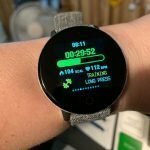 So, if you’re looking for a watch that is good for running at a similar price point, I’d point you to the Amazfit Bip. Battery life certainly isn’t an issue with it and I”ve had really good luck with it, as well as most other reviewers. If you’re looking for a more advanced running watch, you might want to check out our Garmin Forerunner Buying Guide. You’ll pay more but you’ll also get Garmin quality. 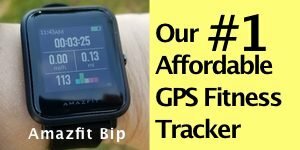 This was the last budget-friendly fitness trackers I chose to review this spring and it certainly turned out to be the best of the bunch, though I really liked the Diggo DB-05 (View on Amazon) as well. 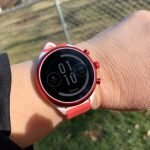 The P1 was priced higher than all three of the inexpensive fitness trackers I chose but still at a very affordable price point considering everything it does –and especially considering it does all of those things very well. 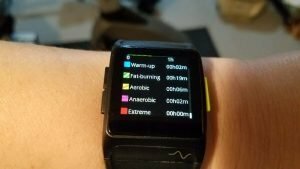 One of the best features of the watch is that it collects and displays quite a bit of data for each activity. This following photos show all the data displayed after walking/running on the treadmill. This information is also available in the app. The app is called Zeroner Health Pro. The P1 also supports sit-ups and jumping rope by counting for you. It was pretty dar accurate for me. I did 20 sit-ups and it counted and it counted exactly 20 and then jumped rope for 20 times and it counted 21. The watch is rated for swimming but doesn’t have a dedicated swimming activity. 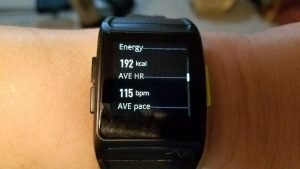 I was most impressed with the heart rate sensor of the P1. The last few trackers I’ve tested have all been very good and that would be the Nokia Steel HR and the new Fitbit Versa. 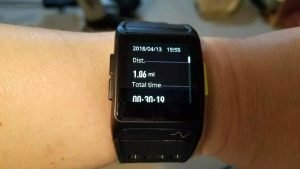 I think optical wrist HR sensors are becoming much more accurate, even in less expensive trackers. 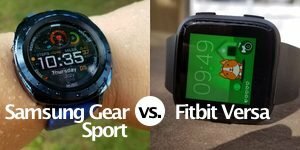 I compared the P1 versus the Wahoo TICKR, a chest heart rate monitor, the Garmin Fenix 5s, the Suunto Spartan Trainer WHR, and the Fitbit Versa. It did very well against all. 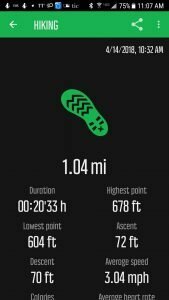 In fact, it did better than the Wahoo TICKR and the Suunto Spartan Trainer WHR that both can have their erratic moments at times. The watch was usually the same as or within 1-2 beats of the chest heart rate monitor (CHRM) and never off by more than 3-4 beats when I was walking and running on the treadmill. Of course for resistance training activities it’s not going to as accurate as a CHRM. 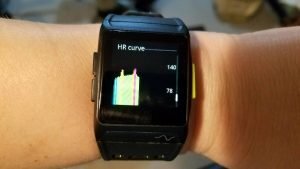 No wrist-based HR sensor is. 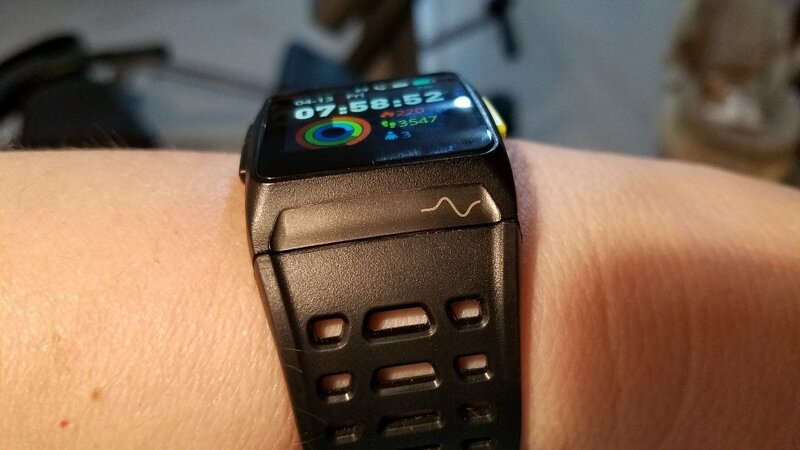 Unlike some trackers, I never had to reposition the watch to get it to properly read my heart rate. It was very stable. The wide strap does a terrific job keeping the watch in place which is necessary for running. I also liked that I didn’t have to wear the watch tight to get a good reading. The strap is very adjustable and allows your skin to get some air too which is nice. 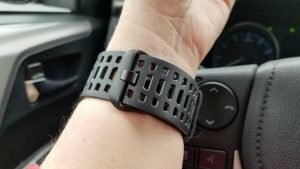 It may seem strange to discuss the strap so much when I’m discussing heart rate accuracy but the right watch strap can make all the difference in ensuring a good HR reading during your activities. The heart rate sensor also did a great job tracking my resting heart rate and was nearly identical to the analysis of the Fenix 5s. Below is a good representative example of the GPS performance on the P1. It claims to be accurate within 3 meters of your position and it appears to live up to those claims. The first image below is of the P1 and it estimated my total distance at 1.03 miles. 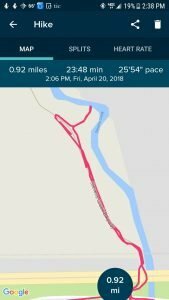 The second and third images are GPS estimates from the Suunto Spartan Trainer WHR which I’ve tested out many times before and know it has an accurate GPS sensor. 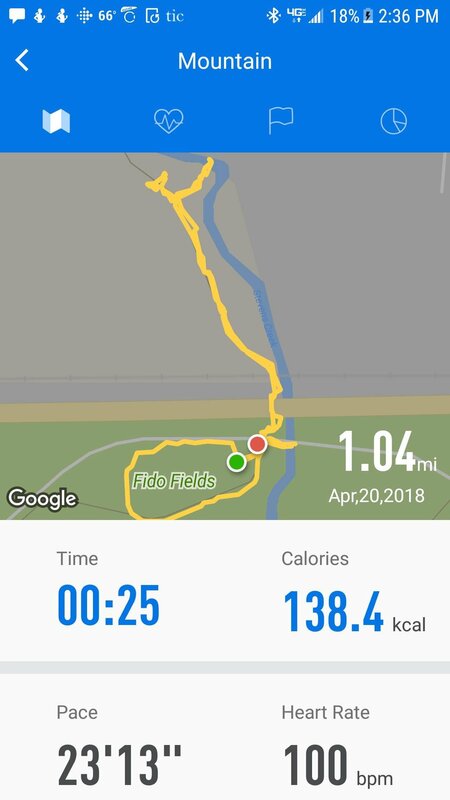 It estimated 1.04 miles. 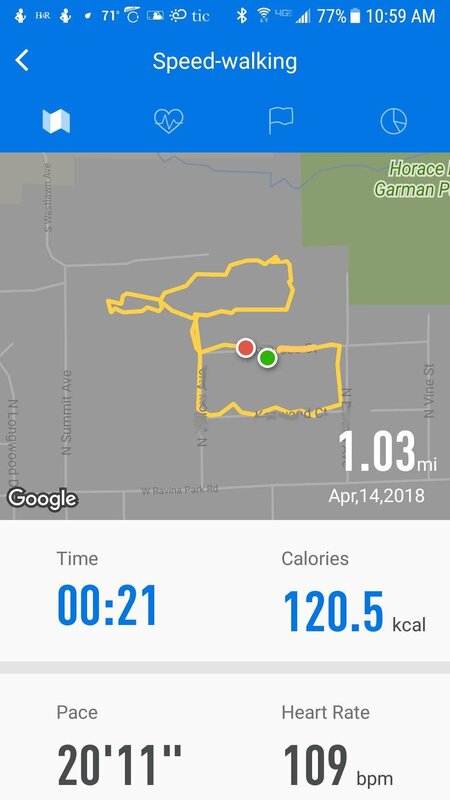 While the Sunnto stayed true to my path within a very small margin of error the P1 wasn’t able to track me as accurately as the Suunto throughout the entire walk but still did a very good job. In other GPS tests it has behaved similar to the one above and so I was happy with the results. It usually took less than 30 seconds to connect but one thing I would like to see changed is for the timer to not start tracking the activity until the GPS has been connected. That can throw off the time estimate but active and paused minutes are shown in the activity data so you can still see your actual moving time. I put it through a tough GPS test in which I was in a variety of different environments such as open areas, forested areas, under a couple of bridges, and through the toughest test of them all, sitting on a park bench. And the bench I sat on! 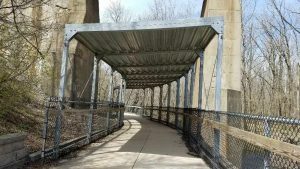 It did good keeping a connection while I walked beneath both of the structures shown above but the toughest test for any GPS is when you’re not moving. 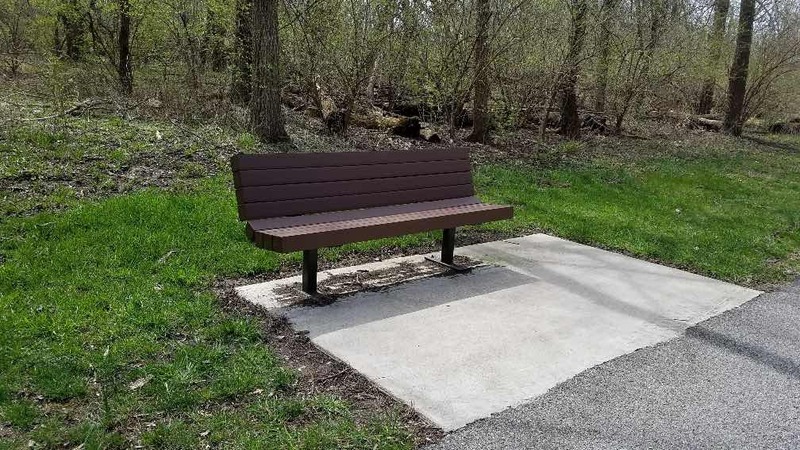 So, I sat on a bench for a few minutes, indicated by the image below. 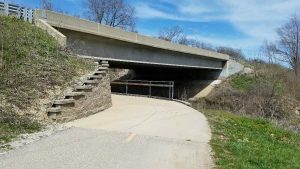 The end of the yellow line along the trail, not by the creek, was the location of the bench. 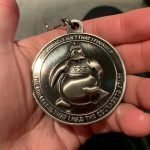 The P1 did a decent job tracking me even though I was still. 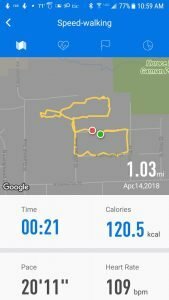 With some GPS watches I’ve tested, they can make it appear like I was square dancing when I was actually standing still for a couple of minutes. This is because the GPS signal is trying to determine where I am and it can actually be more difficult when I’m not moving. 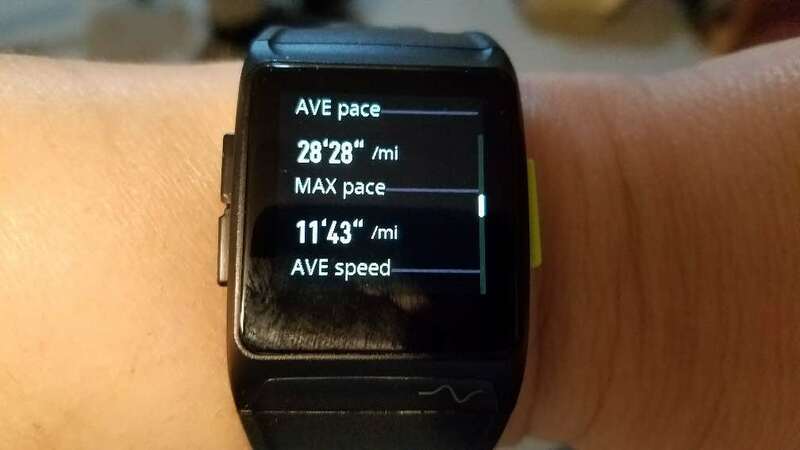 Of course, the Versa which I was testing it against uses a connected GPS by using my phone’s GPS but that didn’t necessarily mean it did a better job. The GPS connection disconnected quite a few times with the Versa. So far, in my testing of the Versa, I’ve discovered its’ Bluetooth connection isn’t the strongest or most reliable but you can read about that in the full review to come in another week or so. Anyway, the P1 estimated I walked 1.04 miles and the Versa estimated .92 miles. I’m inclined to believe the P1 over the Versa since there were so many times the Versa was trying to reconnect with my phone. In forested conditions with large trees the P1 temporarily loses signal but I’d expect that. It didn’t during this particular test but I wasn’t in a densely forested area and leaves weren’t on the trees yet. 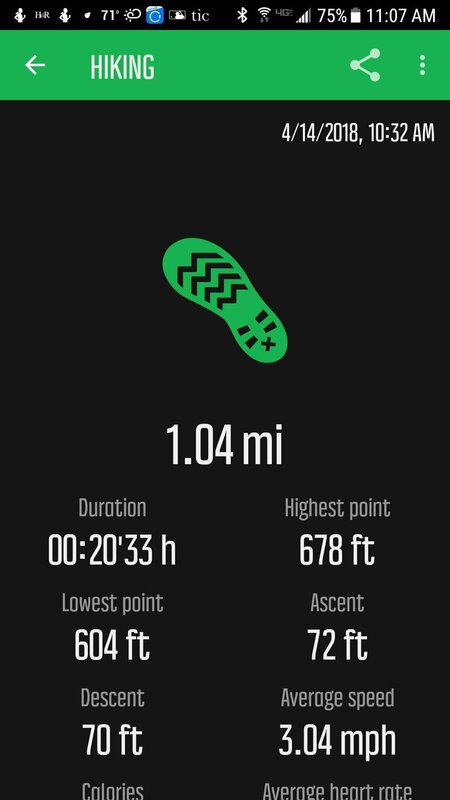 The P1 has a feature I hadn’t seen on any other fitness tracker before. 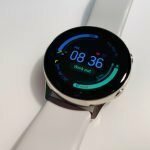 In addition to the optical heart rate sensor on the bottom of the watch, it also has a ECG sensor for monitoring fatigue. The little squiggly line indicates where to place your finger for analysis. It seemed to do a good job estimating my fatigue level. As a wife, mom, and grandmother running a business out of her house, I’m usually pooped. It picked up on that well! There wasn’t too many times when I was full of energy. The purpose of monitoring your fatigue level is to help prevent injuries and severe fatigue. The squiggly line is the area where your finger goes for the fatigue test. 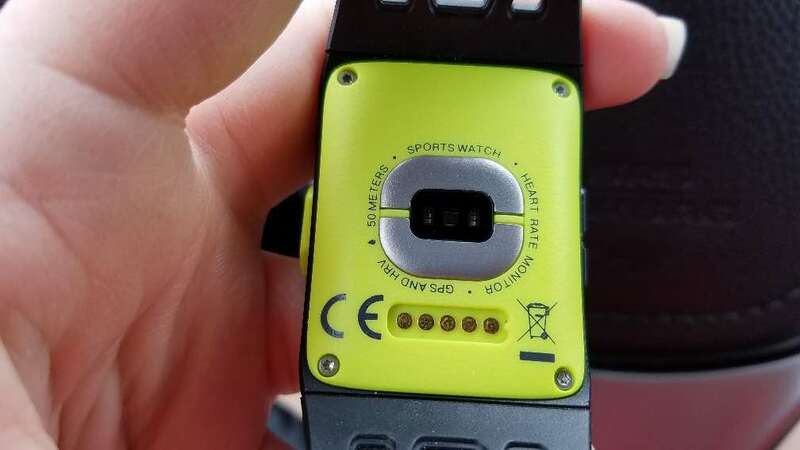 You also need to be wearing the watch on your wrist because I think it uses both sensors for the analysis. I didn’t assign a grade for this particular features since I didn’t have anything to compare it against but it seemed accurate. 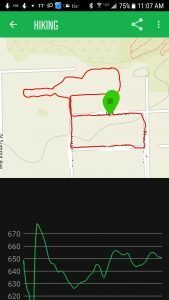 I was pleased with the step tracking on the P1. This is an area where I’ve been aggravated by other fitness trackers that either woefully underestimate or overestimate my steps. 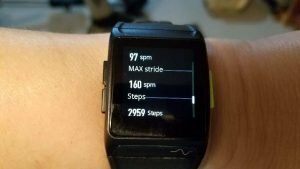 The P1 was 96-97% accurate each time I walked 100 steps. If anything, it under counts by just a tad. 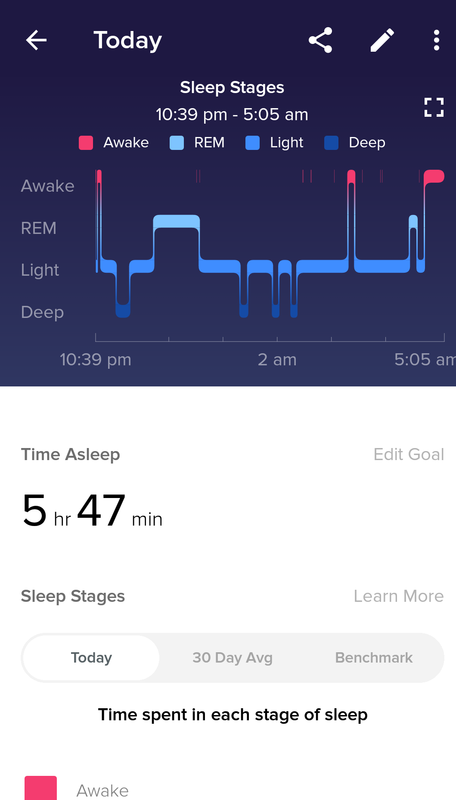 The P1 also surprised me by how well it tracked my sleep. 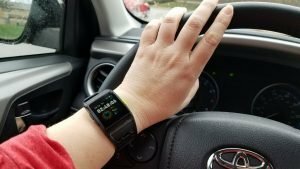 It did better or just as good as both the Fitbit Blaze and Versa . The images below are from last night and I know what time I woke up and the approximate time I fell asleep. 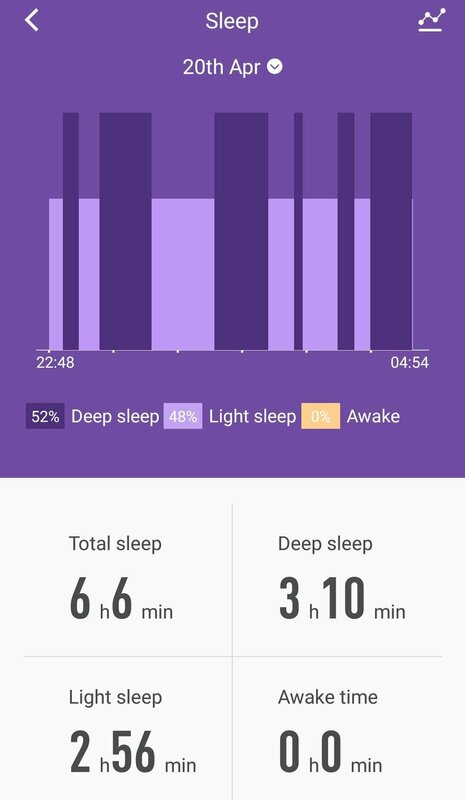 The P1 did the better job though it doesn’t distinguish REM sleep. Still, it did great. I was afraid that the watch was going to by too large for my wrist and clunky but it fit very well. It’s lightweight and has a slim profile. There are three physical buttons that can be used to operate the watch or you can alternatively use the touch screen. I found the watch to be very comfortable to wear and I liked the style of it even though it is a sports watch. My only gripe/complaint is that the strap isn’t replaceable so I’m hoping that it holds up to wear. 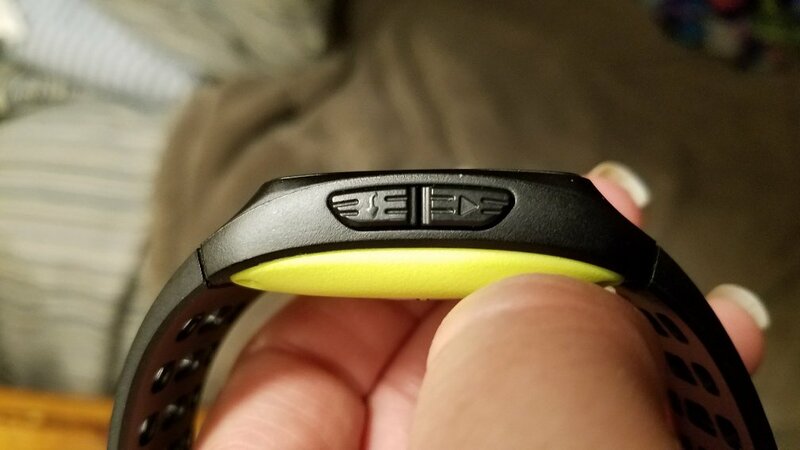 The clasp is made out of metal and the band itself is a thick material (I’m assuming silicone) so I don’t anticipate any problems. 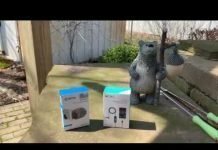 The screen is bright enough to be seen outdoors and this is definitely an area where more budget-friendly trackers fail the test. However, I was able to view the screen easily in the brightest sunlight. You can manually adjust the brightness of the screen though I’d prefer an auto-detect feature but I’m not going to complain at this price point. 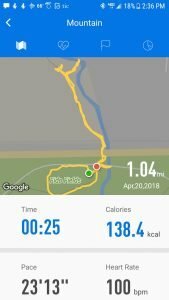 The Zeroner Health Pro app did a good job for me. The maps it produced for the GPS tests were detailed. 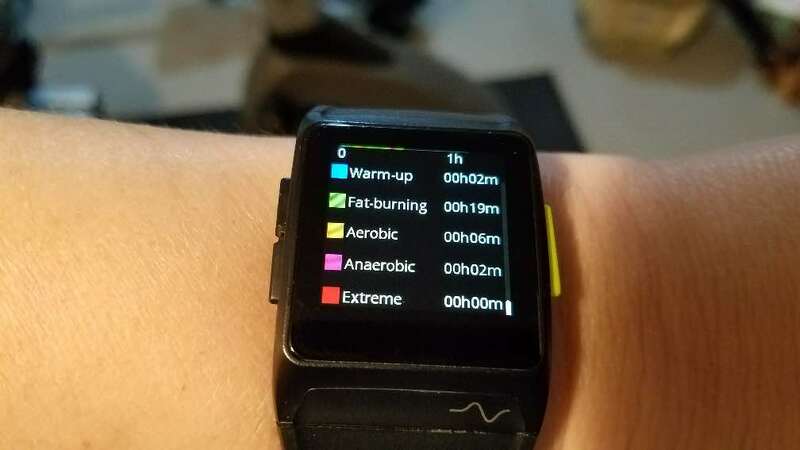 Heart rate data is displayed in a visually appealing and easily understood format with color coded categories. 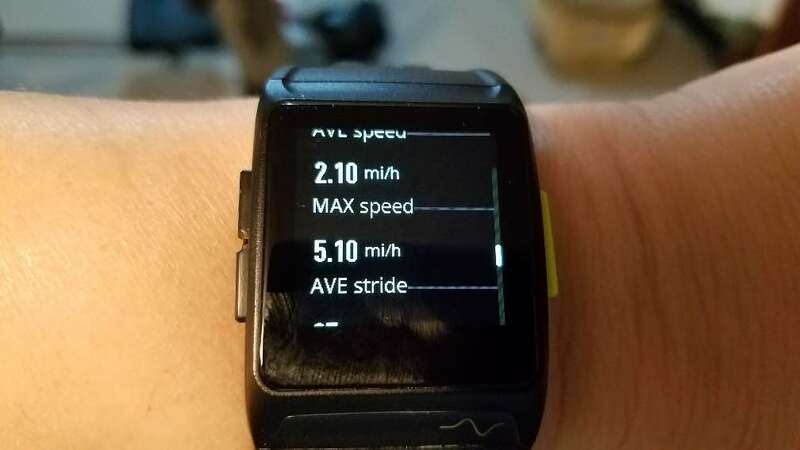 Pace and stride frequency is also displayed in graphs. It’s a simple, easy to use app and I never had an issue with syncing. One thing I didn’t like about the app is that it seems to only store a week’s worth of data, unless the data was lost on mine for some reason. The P1 remained connected to my phone (Samsung Galaxy S7) and I always received notifications if I was in range of my phone. The range seemed to be around 30 feet or so. 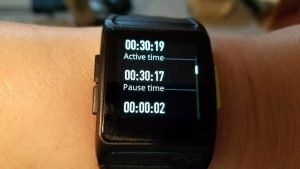 Now the Fitbit Versa on the other hand. Oh yeah, that’s next week’s review! 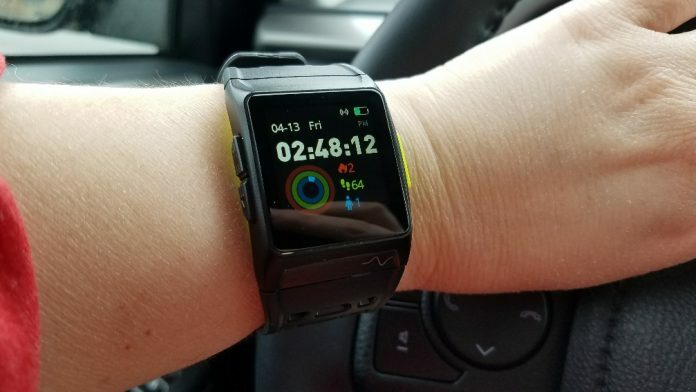 During a 30-minute GPS activity the watch drained 9% of the battery which isn’t bad. Depending upon how many GPS activities you do during the week, it’ll probably last you 5-7 days between charges, probably a little longer without using GPS. If you have read this far you can probably tell that the watch tested out very well and I am very happy with the results. 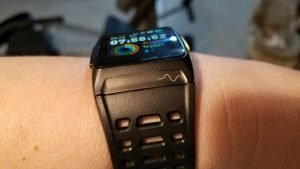 It’s not too often that I test a fitness tracker or GPS sports watch that tests out as good as this one. I usually find some aspect in which they fall short of my expectations but I just didn’t with this one. It did a terrific job in all my tests and based upon my experience with the P1 GPS Sport Watch I can confidently recommend it if you’re considering it. 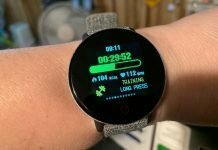 The P1 GPS Sport Watch is the best budget-friendly tracker I've reviewed yet. It did a very good job with everything I threw at it. Previous articleIs The Fitbit Versa Worth It?